You are currently browsing the category archive for the ‘Biblical artifacts’ category. The word “ark” refers to a box-like vessel. The ark was a modified box-shaped craft like a modern oil tanker. It was 300 cubits long, 50 cubits wide, and 30 cubits high (Gen. 6:15). Given a cubit of 18 inches, this would have been 450 feet long by 75 feet wide by 45 feet high. It was three stories high (Gen. 5:16). It had one window and one door (Gen. 6:16). It was made of gopher wood and pitched within and without so that it was watertight (Gen. 6:14). Though we do not know what gopher wood was, it is obvious that it was a strong and pliable wood suitable for the purpose. The pitch was some sort of waterproofing, such as the slime or bitumen that was used in building the Tower of Babel (Gen. 11:3). Was it stable enough and strong enough to withstand the raging sea? 1. The Bible says that God instructed Noah how to build the ark, and those who believe in an Almighty, All-wise God have no problem believing that He could construct an ark that was strong enough to do this job. 2. Further, about 1,600 years had passed since creation, and the technological level of man was doubtless very advanced. Adam’s first sons were skilled in city building, metal working, agriculture, music, etc. (Gen. 4:20-22). Men lived to long ages then and had one language so knowledge would have increased rapidly. At the Tower of Babel, God said that because of man’s intelligence and unified language, “nothing will be restrained from them, which they have imagined to do” (Gen. 11:6). The Creation Museum in Cincinnati, Ohio, has a large section that demonstrates how that men in ancient times had the knowledge to build wooden vessels with multi-layered hulls that could withstand the conditions encountered by the ark. Though some skeptics have claimed that such a large ship could not be constructed out of wood, in fact ships just as large as the ark existed in ancient times. The third century B.C. Leontifera, a fighting ship with 1,600 rowers, was between 400 and 500 feet long. Another third century B.C. ship, which was built by Ptolemy Philopator to carry 7,250 men, was 420 feet long (“The Large Ships of Antiquity,” Creation ex nihilo, June 2000). 3. The ark’s dimensions were perfect. The ratio of length to breadth was 6 to 1. Some giant oil tankers are 7 to 1. A model of the ark made by Peter Jansen of Holland proved that it was almost impossible to capsize (John Whitcomb, The World that Perished, p. 24). Was the ark large enough to carry all of the animals? 1. Noah only needed to carry a representative of each major kind of creature and not every variety within the kinds. 2. 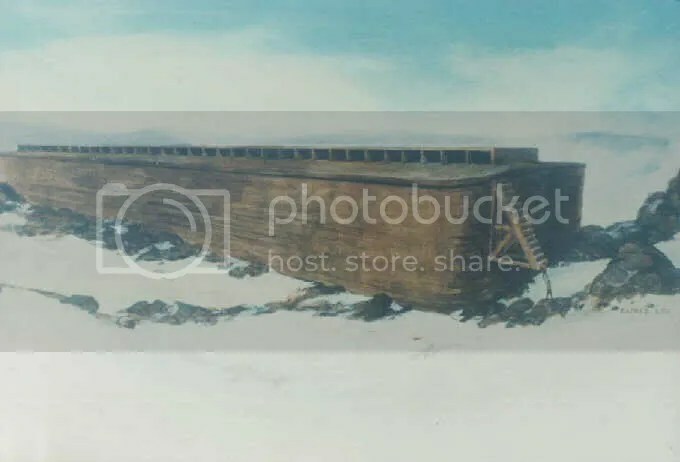 The following is a description of the ark if the cubit was 18 inches: “Its carrying capacity equaled that of 522 standard railroad stock cars (each of which can hold 240 sheep). Only 188 cars would be required to hold 45,000 sheep-sized animals, leaving three trains of 104 cars each for food, Noah’s family, and ‘range’ for the animals. Today it is estimated that there are 17,600 species of animals, making 45,000 a likely approximation of the number Noah might have taken into the Ark” (Ryrie Study Bible). 3. It is also possible that the cubit in Genesis 6 was larger than 18 inches, which would mean that the ark would have been even larger than the previous description. “The Babylonians had a ‘royal’ cubit of about 19.8 inches, the Egyptians had a longer and a shorter cubit of about 20.65 inches and 17.6 inches respectively, while the Hebrews apparently had a long cubit of 20.4 inches (Ezek. 40:5) and a common cubit of about 17.5 inches” (R.B.Y. Scott, “Weights and Measures of the Bible,” The Biblical Archaeologist, May 1959, pp. 22-27, summarized by Whitcomb and Morris, The Genesis Flood). 4. As for the dinosaurs, their average size, based on the fossil record, was the size of a sheep or small pony (Ken Ham, The New Answers Book, p. 167, quoting M. Crichton, The Lost World, p. 122). Struthiomimus, for example, was the size of an ostrich, and Compsognathus was the size of a chicken. Thus, only some of them were overly large, and of these, Noah could have taken the eggs or he could have taken juveniles. Even the largest dinosaurs were small when first hatched. Since reptiles can grow as long as they live, the large dinosaurs from the fossil record were probably very old ones (The New Answers Book). “There were probably fewer than 50 distinct groups or kinds of dinosaurs that had to be on the Ark” (The New Answers Book, p. 168). Sharing Policy: You may freely copy and share and/or use excerpts from this article. You should mention the full name of the article and credit David Cloud, Way of Life Literature, www.wayoflife.org. Is the Shroud of Turin really Jesus’ burial shroud? The scientific debate over the authenticity and age of the shroud, and the origin or cause of the image, has spanned centuries and continues today. But scientific analysis is not needed to answer the question of whether the shroud is really the cloth in which Jesus was buried. There is clear biblical evidence that will tell us whether the Shroud of Turin is genuinely Jesus’ burial cloth. Let’s examine it. Luke 23:53 says this: “He took it down, and wrapped it in a linen cloth, and laid him in a tomb that was cut in stone, where no one had ever been laid.” “Wrapped” is the same word Matthew uses, entulissō. “Linen cloth” is again sindōn. John tells us this: “Nicodemus, who at first came to Jesus by night, also came bringing a mixture of myrrh and aloes, about a hundred Roman pounds. So they took Jesus’ body, and bound it in linen cloths with the spices, as the custom of the Jews is to bury” (John 19:39-40). “Bound” in this verse comes from the Greek word deō. It means to “bind, fasten, or tie up.” “Linen cloths” this time is from the Greek word othonion. Specifically, it is othoniois, which is the plural. It means “strips of linen bandages.” In other words, Joseph and Nicodemus wound Jesus and the spices in tightly bound strips of clean, fine linen bandages. After Jesus’ resurrection, Mary Magdalene and the other women reported the empty tomb to the apostles. Luke tells their reaction: “These words seemed to them to be nonsense, and they didn’t believe them. But Peter got up and ran to the tomb. Stooping and looking in, he saw the strips of linen lying by themselves, and he departed to his home, wondering what had happened” (Luke 24:11-12). “Strips of linen” is again from the plural form of othonion. Therefore she ran and came to Simon Peter, and to the other disciple whom Jesus loved, and said to them, “They have taken away the Lord out of the tomb, and we don’t know where they have laid him!” Therefore Peter and the other disciple went out, and they went toward the tomb. They both ran together. The other disciple outran Peter, and came to the tomb first. Stooping and looking in, he saw the linen cloths lying, yet he didn’t enter in. Then Simon Peter came, following him, and entered into the tomb. He saw the linen cloths lying, and the cloth that had been on his head, not lying with the linen cloths, but rolled up in a place by itself. So then the other disciple who came first to the tomb also entered in, and he saw and believed. For as yet they didn’t know the Scripture, that he must rise from the dead. So the disciples went away again to their own homes. What John’s account shows us is that, apart from Jesus’ torso being bound with strips of linen cloth somewhat like a mummy, Jesus’ head was wrapped in a separate handkerchief. The Shroud of Turin is a one-piece sheet of linen. The image of the body and head is within that one cloth. This does not at all agree with the biblical account of the way Jesus was buried. As we have just seen, Jesus’ torso was wound with strips of clean, fine, linen bandages, and His head was wrapped with a separate cloth or napkin. This evidence from the Word of God proves the Shroud of Turin to not be the burial cloth of Jesus Christ. It also proves the pope to be fallible, and exposes him as someone who rejects the Word of God. As for what the Shroud of Turin really is, we can let the scientists debate about that. From Got Questions? Would the discovery of Noah’s Ark be important? Answer: There have been numerous claimed discoveries of Noah’s Ark in recent years. The discoveries have been in various locations, ranging from Mount Ararat in Turkey, to a mountain range in Iran, to an entirely different location on Mount Ararat (with a visitors’ center). It is not the purpose of this article to evaluate whether or not the Noah’s Ark discovery claims are legitimate. Rather, the question at hand is: If Noah’s Ark was discovered, would that be significant? Would the discovery of Noah’s Ark cause people to turn to God in faith? The discovery of a boat-like structure in the mountains of the Middle East, carbon dated to approximately the time of the biblical account of Noah’s Ark (2500 B.C), with evidence of animal life once having been aboard would surely be a tremendous discovery. For those who believe in God and trust in the Bible as His inspired Word, it would be powerful confirmation that the Bible is true and that early human history occurred precisely as the Bible describes it. A verified discovery of Noah’s Ark would likely cause many seekers and open-minded skeptics to at least re-evaluate their beliefs. For the close-minded critic and hardened atheist, however, the discovery of Noah’s Ark would not make one bit of a difference. Romans 1:19-20 declares, “For what can be known about God is plain to them, because God has shown it to them. For His invisible attributes, namely, His eternal power and divine nature, have been clearly perceived, ever since the creation of the world, in the things that have been made. So they are without excuse” (ESV). If a person is rejecting the clear evidence of God in the universe, no biblically-related discovery would change his/her mind. Similarly, in Luke 16:31, Jesus declared, “If they do not hear Moses and the Prophets, neither will they be convinced if someone should rise from the dead.” No discovery, no argument, and no miracle will change the mind of a person who has been blinded by Satan (2 Corinthians 4:4) and is, with a hard heart and closed mind, rejecting the light of the Gospel. Conversely, would it matter if Noah’s Ark is never discovered? No, it would not matter because the Christian faith is not built on every biblical account being explicitly/conclusively proven. The Christian faith is built on faith. “Blessed are those who have not seen and yet have believed” (John 20:29). With that in mind, though, there are two primary explanations for why Noah’s Ark might never be discovered. First, the wood of the Ark would have been very valuable post-Flood. Noah and his family would have needed wood to build their homes. It is possible that Noah and his family, or their descendants, deconstructed the Ark and used its wood for other purposes. Second, even if Noah and his family left the Ark intact, approximately 4500 years have passed (if the biblical account is interpreted strictly literally). A wooden structure exposed to harsh elements for 4500 years would, for the most part, decompose/decay into virtual nothingness. While the discovery of Noah’s Ark would be a tremendous and powerful archaeological find, it will never be something Christians should place their faith in. The discovery of Noah’s Ark, or the Ark of the Covenant, or the Garden of Eden, or any other biblical artifact will not prove the Christian faith and will not change the mind of anyone whom God is not drawing (John 6:44). “Faith is the assurance of things hoped for, the conviction of things not seen” (Hebrews 11:1).